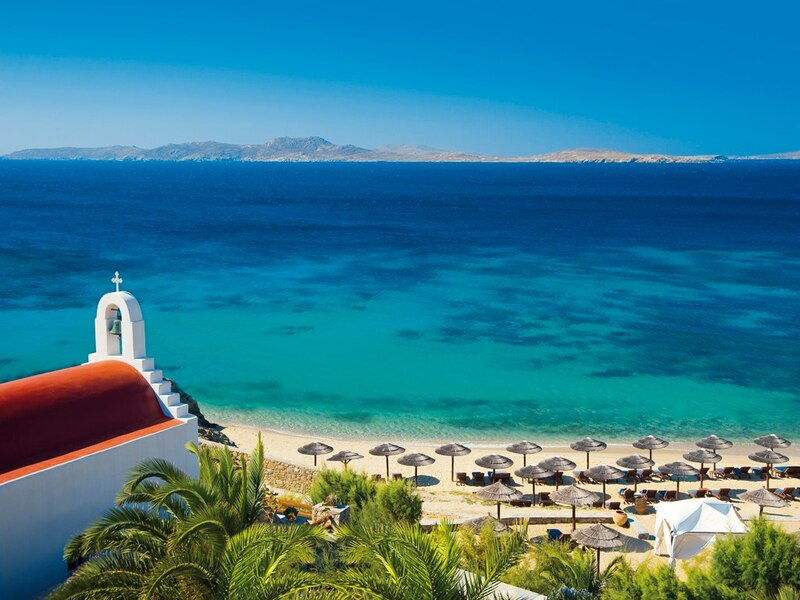 Mykonos has developed in the 70’s into one of the most popular travel destinations in the Mediterranean. Mykonos is visited by over a million of tourists every year, many of whom are international VIP’s. A great, cosmopolitan place, with great opportunities for nightlife throughout the City’s and the Port’s picturesque alleyways, is probably still under the protection of the wine god Dionysus! While this colorful river of people floods into the island every year, Mykonos is always charming, extra white, blue and flooded with light; it is still the traditional island of the Cyclades, where one can enjoy the local spicy cheese, tasty kopanisti, and listen to the elder people of Mykonos speak their special idiom, wearing stubbornly their black seaman’s cap. Mykonos is one of the many beautiful islands of Greece, as well as a top notch tourism destination famous for its cosmopolitan character and intense nightlife. Mykonos is part of the Cyclades island complex, located between Tinos, Siros, Paros and Naxos. The island stretches over 105183 square kilometers and its highest peak is at an altitude of 341 meters. In the not so distant past, Mykonos was a beautiful, but poor island in the Cyclades, blessed by nature with its impressive granite rocks and uniquely amazing sand strips and beaches. People living in Mykonos were trying to survive working with or against the elements of nature and managed to make a decent living for many centuries. All this gave the island a unique character that a few decades ago attracted the first affluent western visitors, who soon turned Mykonos island into one of the most popular tourism destinations in the world. From the island’s past, only the granites and the sand have survived, still noticeable under the countless sun umbrellas and lounge chairs. Today, the heart of European lifestyle beats in Mykonos; people gather here to see and be seen, enjoy themselves and bask in the loud and vivid cosmopolitan way of life. If this is what your dream vacation sounds like, then Mykonos is no doubt the place for you. Despite this facet of Mykonos, visitors can still come here and enjoy the inner peace offered by the contact with nature. There are numerous beaches and landscapes in Mykonos still untouched by its cosmopolitan character and ideal for passing time whilst relaxing. You could also visit the various archeological sites and monuments scattered around the island. Mykonos island has also proved a marvelous island for family vacations, for those who can utilize its alternative lifestyle. Mykonos covers an area of approximately 85 km2 and it is situated almost in the middle, between Tinos and Naxos and east of Syros, where Ermoupolis, the capital of Cyclades is situated. Mykonos’ population is at about 9,500 people but during the summer period the number of tourists visiting the island is multiple. The soil is generally rocky and arid and this fact has turned the people’s interest to fishing, navigation and emigration. The presence and activation of the French Archaeological Institute, which concucted excavations for decades and has brought to light the priceless treasures of Delos has helped a lot. The Mykonians easily adapted themselves to the new conditions, a fact that quickly gave the “mykonian tourist model”. Led by intuition and hard work, Mykonos improves the services offered and claims a distinguished position in the international tourist industry, having as competition places of much larger sizes. Mykonos alone attracts one tenth of the number of tourists visiting Greece every year. The island complex including Mykonos, Delos and Rinia and the adjacent rocky islets (traghonisi, Htapodhia) is east of Syros, southeast of Tinos and north of Paros and Naxos. The terrain of these islands is mainly granite, thus it is arid and infertile. Altitudes are low, and tallest praks approach 373m on Mykonos (Profitis Ilias Varniotis), 136m on Rinia (Aghrelou, Houlakas) and just 112m on Delos with Kynthos, from where Zeus watched the birth of Apollo. The coastline of Mykonos is 89 km long, with quite a few bays forming beautiful beaches, thanks to which –among others- the island obtained its fame. The sandy beaches of Mykonos owe their existence to the erosion of granitic rocks and the large concentration of granitic sand at river estuaries, with the help of rain and strong winds. The complex of Delos – Rinia is similar. Because of the terrain morphology, water supply on the island of Mykonos is limited. For this reason two dams have been built on Mykonos to collect surface water: the dam of Marathia, NE of Hora, which forms the artificial lake of Marathi and the dam of Ano Mera, at the Maou Langadha torren, in the NE part of the island. The island’s climate is particularly dry; in combination with the rocky terrain and the shortage of water, this favors maquis and phrygana vegetationwhich, nevertheless, does not lack interest. Among plants on the island, 26 are either endemic or rare and threatened species. The small yellow poppy Hypecoum procumbens ssp. Fragantissimum, which you will see growing in the island, is native to Mykonos. The island’s fauna, albeit poor because of the limited vegetation, is very varied. Mammals include hedgehogs, hares, wild rabbits, ferrets and mice, and reptiles are represented by11 different protected species. Furthermore Mykonos is on the migratory passage of birds, though they seem to prefer the peace and quiet of Rinia, Delos and the neighboring rocky islands. Rinia and Delos are archaeological sites under the auspices of the Ministry of Culture, thus any activity is prohibited except by special permit by the Minister. Furthermore, Rinia together with the rocky islets Traghonisi and Htapodhia are included in a program for the conservation of the islands’ flora and fauna as Special Protection Areas. Mykonos has a temperate but fairly dry climate, generally similar to that of the other south Aegean Sea islands. Winters are mild and strong north winds dominate the island in July and August; their strength is usually around 6 to 7 on the beaufort scale, while sometimes they get up to 8 or 9 beauforts. When the weather is not windy though, the summer heat makes its presence known, since the average temperature in the summer reaches 25° C. Winters in Mykonos are mild, compared to other Greek regions, with rare rainfall due to the limited vegetation and microclimate formation, while snowfall is rare to improbable. The average temperature in Mykonos during the winter months is 12° C. The average annual sunshine is approximately 2700 hours, while the sea temperature from May to October is between 18°C and 22° C.